Kid Rock is mad as hell about scalpers and doesn't want to take it anymore. So he isn't. The Detroit rocker is among a growing number of acts whose summer tours will feature tickets that can only be picked up day of show at the venue with ID. "It's real simple: When you buy something, it should be your property," says Rock. "You can't tell me how to sell my tickets to my fans. And there should be a way to protect fans from scalpers, which is why I'm driving this." By whatever name — restricted, paperless, will call — these tickets typically cover only the most coveted rows at a venue, seats that on secondary markets such as StubHub and eBay often fetch many times face value. Joining Rock (who made news with his fan-friendly $20 pricing) are more than a dozen other top acts who will make a select amount of tickets paperless — about a tenth of 1%, according to Ticketmaster. Around 400 summer dates will feature such tickets, more than double last summer. Performers embracing the practice include Mumford & Sons and Rascal Flatts, both of whom launched their tours last week, Tom Petty, John Mayer and Keith Urban. But while some musicians and fans see this growing trend as a way to neutralize the growth of high-priced resale outlets, others are concerned about buyers' rights. At present, ticketless options don't make provisions for those fans who encounter last-minute conflicts or who simply want to offer a ticket to a friend. "It's not that they are paperless that's the issue, it's that they are non-transferable," says Christopher Grimm, communications director for the advocacy group Fan Freedom. "Fans tell us they want the choice of keeping a ticket or even just going into a venue before their friends arrive, but if you buy as a group, you have to go in together," says Grimm, whose group receives funding from StubHub. "Our fear is that eventually every ticket will be restricted, which means if you want to get rid of it, you have to play by the rules of the company that sold it to you." StubHub CEO Chris Tsakalakis says the push to paperless tickets isn't about stopping scalpers as much as it is an attempt to put resale rights in the hands of ticket companies. "(Restricted tickets) just extend the monopoly of Ticketmaster, and prevent fans from selling or even just giving their tickets away," he says. "None of this would be an issue if, as with many other industries, consumers who couldn't make use of the product could just get a refund. But the ticketing industry has never been customer-friendly." Michael Rapino, CEO of Live Nation Entertainment, which owns Ticketmaster, acknowledges that "the exception to the rule, like a fan getting sick, has to be addressed" with restricted ticketing, but ultimately "we work for the venue and the artist." Rapino says he "has no problem with the free market, but we differ with StubHub in that we don't think the secondary market should be the place for the first purchase." 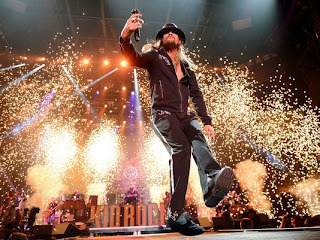 Kid Rock says he feels for those fans who buy a restricted ticket and then can't make the show, "but it's really the only way to combat scalpers. Besides, my show's $20. I don't think that if you can't make the gig you're going to lose too much sleep over it." Rock may have made millions with his music, but he's proud of his blue-collar roots and fans, lamenting that people squeezed by the tight economy are being priced out of live events. "Sports, concerts, it's all getting out of hand," he says. "When I heard the (Rolling) Stones tickets were $600, I thought, 'Wow, I love them, but I wouldn't pay that to see strippers.' "